On the 3rd of September when Aldebaran and the Moon were be on Midheaven, I made the talismans of wealth, power, good luck. More about this planetary election you can read HERE. 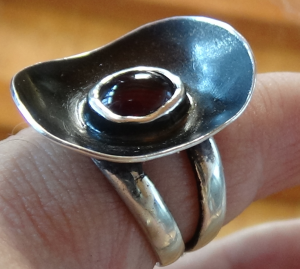 The ring is made of sterling silver and is SIZE 6. The gem is a small natural HESSONITE GARNET around 6mm. Every gemstone is unique, so the colors can slightly vary from what you see on the picture. The magic symbols and characters of ALDEBARAN is carved on the front side of the gem. The ring is made by a Scottish jeweler. The size of the ring is flexible. 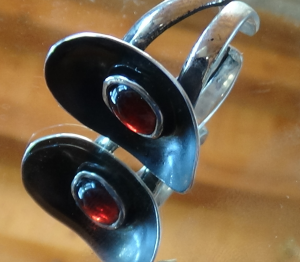 The gem is a natural wine red HESSONITE GARNET. Every gemstone is unique, so the colors can slightly vary from what you see on the picture. On the 3rd of September when Aldebaran and the Moon will be on Midheaven, I will make the talismans of wealth, power, good luck. More about this planetary election you can read HERE. The gem is a natural dark wine red large HESSONITE GARNET. Every gemstone is unique, so the colors can slightly vary from what you see on the picture.